In 2012, I reached the summit of Mt. 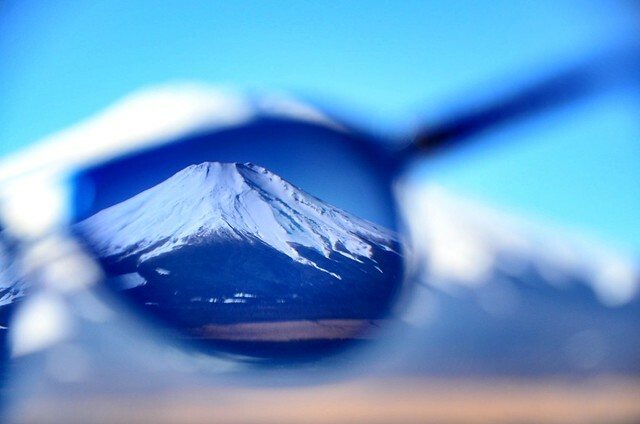 Fuji, Japan's tallest mountain. It was one of the highlights of my stay here in Japan, though I don't have any plan to climb it again. However, I had plans of visiting the five lakes surrounding Mt. Fuji. 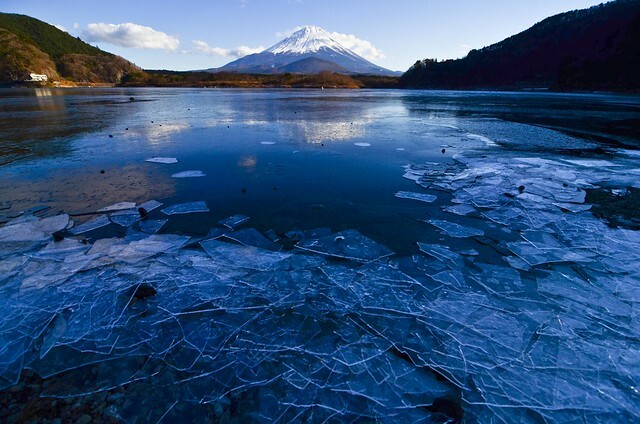 Luckily, there was an available Fujigoko (Fuji five lakes) photo tour at the start of the year. The one day tour costs from 8,000 - 12,000 yen depending on the travel date. After a disappointing first sunrise of the year adventure, I, Alaine and Noli thought that this tour could possibly erase our disappointments. For days prior to the event date, we hoped for a perfect weather. It was given to us. The tour was led by Sugi-sensei. He gave useful tips on how to capture the beauty and magnificence of Mt. Fuji… in Japanese. I am so thankful for my friends for translating those tips for me. Most of times though, we joined photo trips because we are too lazy to plan everything on our own. As for the description of each lake, I will be quoting Japan Guide. First stop was at Lake Yamanakako. Must be because of the cold temperature or some have New Year hang-over, not so many people were there during our trip. Still, we had the swan as a willing model. Next was at Lake Kawaguchiko. I have been here four times already so I did not take much photos. Also, I didn't like the spot where we were given 30 minutes to shoot. Then we went to Lake Saiko. Mt. Fuji is blocked by the mountains and I think this was one of the reasons why it's the least popular among the five lake. My favorite was Lake Shojiko. The frozen lake was pure magic especially when the ice starts breaking. Click the video of ice breaking here. The last was Lake Motosuko. Lots of memories came back as this was the first place I went to since returning back to Japan in 2008. This was also the place where I took serenity, which is still one of my favorite Fuji shots. 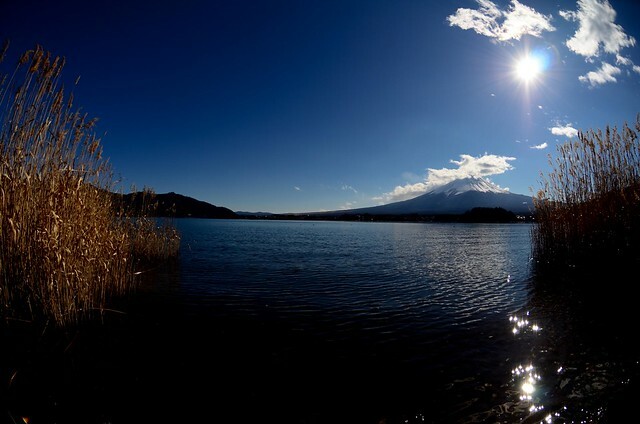 Lake Motosuko (13 km circumference) is the westernmost of the five lakes and has good views of Mount Fuji, including the view which appears on the back of the 1000 yen bill. more here. Mt. Fuji continues to amaze me. I will never get tired taking her photos. Perhaps I could make a book about her. But first, I have to learn more about long exposure photography. oy, ok...got it....seems pretty obvious eh? Those wonders are so adorably alluring. Thank you for sharing 'em to us. I like your haiku with Mt. Fuji personified as white-haired queen! most of the time, she has the snow cap... in all four seasons. but the 12 hour hike is something i won't do again. maybe haha. Oh, those photos are out of this world, Totomai. I feel as if I am right there. And, yes, perhaps you could make a book totally of Fuji! I liked your haiku. 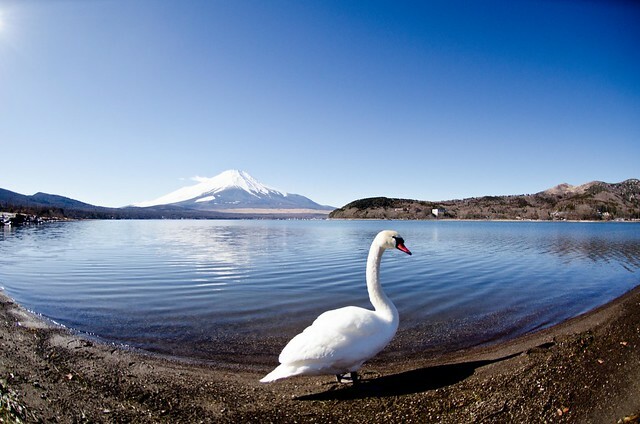 Fuji is a 'diamond' indeed, and your photos do her justice! thanks. the icy lake is also my favorite. Clearly you were very lucky with the weather. You are such a gifted photographer and it is a joy to view your work. i dont know what would have i done if the weather was bad haha. The poem of the white queen.. yes you are so right in your comment on my poem.. there is also a sadness of those snowcapped mountains.. I had admired the clinking of ice very much. If you ever come to Sweden we have to go look for motives together... I think your pictures breathing cold weather instead of the post-card cherry-blossom kind is by far better.. and got me thinking of the woodblocks by Hokusai. Especially the one with the ice that to me speaks the same way as the tsunami with Fuji in the background. Thanks Kabayan. I wanted to describe it in my own words but I need historical references so I quote some of the descriptions from Japan Guide. Sometimes, I guess we need to open our eyes to appreciate even our least favorite season. Beautiful pics Totomai. The eye of the pro is no match to what an amateur tries to do with a camera! Your photos are stunning. 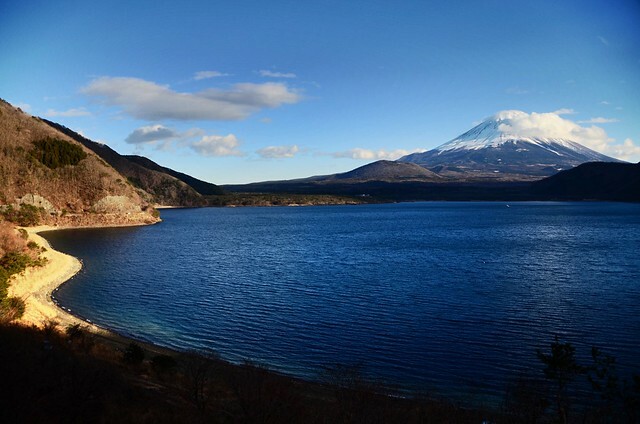 I did not know there were five lakes near Mount Fuji. A haiku was the perfect choice for such beauty. "five teardrops in fours seasons' - my favorite line. you're welcome Gillena. mt. fuji is blushing every spring. those area really beautiful photographs and a lovely haiku. Fuji is Japan's diamond ! Stunning photos. I wrote a post on your photography. Pop over and have a look ! Gorgeous on so many levels! Totomai, your photos - and the landscape - are spectacularly beautiful. Wow! That is a very cool tour, to see that many lakes in one day. 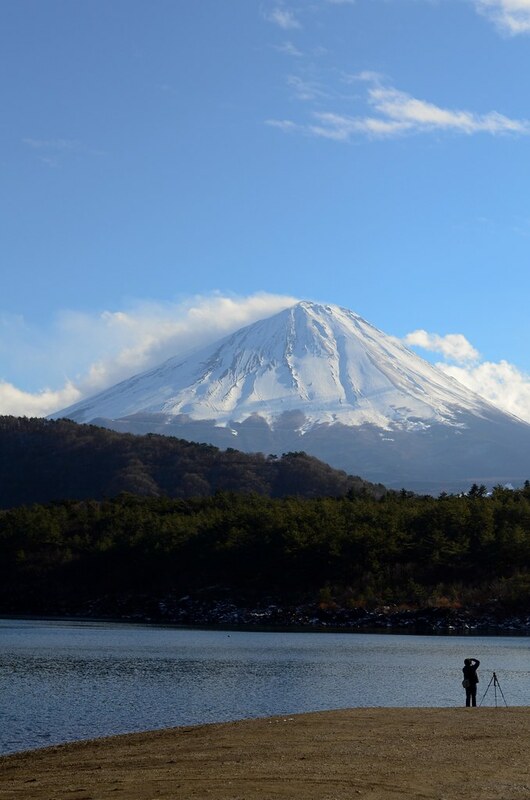 My fave shot is Lake Saiko, as the mountain is so close and imposing in that shot. I love your poem!!! The white haired queen crying five teardrops is a wonderful explanation for the lakes. This is a wonderful journey, and I hope that I can share one with other people someday. I loved the images that you've provided because they helped me imagine being there. Your eye catches raw beauty. Thank you for sharing these places with us. Beautiful array of photos, and like others before me, I was touched by your lines of poetry about the white queen. You have a very good eye for capturing the scene. Also liked the ones that were shared on the Poetry Pantry's site. One especially, the autumn trees...may I play with it, please? wow those are some lovely clicks! Superb photographs, and what a trip!! I enjoyed the poem very much. 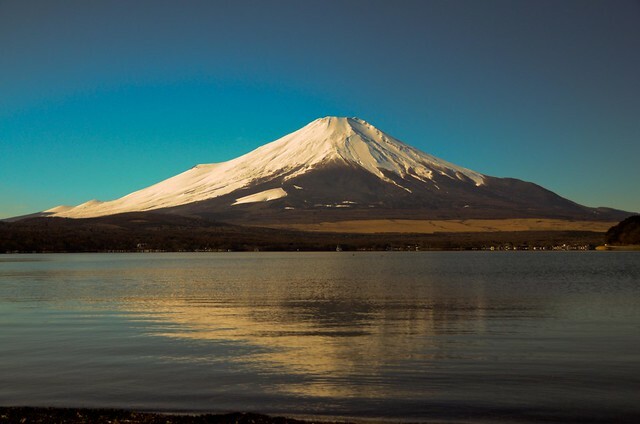 Lovely photos, and a great poem for Fujiyama. the perfect poet award for week 80, please enjoy and have fun for next poets rally.